Jewellery making with beads is a fun and rewarding hobby that can easily turn into a business and what better way to start than with the current hot fashion in the jewellery market, Pandora style charm bracelets and beads. Jewellery pieces can be made very easily with no skill. All you need is imagination to make stylish designs. Pandora bracelets were created by a Danish company using the best designers to create beautiful beads and jewellery using Italian Murano glass, Sterling silver and 18kt gold. They perfected a simple and flexible technique to create personalised and interchangable charm bracelets. In the past couple of years this concept of jewellery has become extremely popular with now a few celebrities wearing them. They work like all charm bracelets, allowing wearers to attach beads of their choice to a bracelet to create their own personalised jewellery piece with its own st ory. These beads are available in a range of materials and shapes from coloured glass beads with inner metal cores to solid metal beads. Shapes and symbols include animals, flowers, birthstones and letters. With such a range of beads to choose from it is very easy to create your own bracelet and just as easier to change it to suit your mood or your outfit colour. The art of designing your bracelets is fun and very easy. Select a base bracelet. These come in a snake chain style in lengths between 7 - 8". 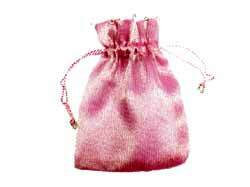 They come in silver plated and Sterling silver with differing clasp types. Next choose clip beads. These are used to clip over the smooth section separators on the base bracelets. These decorative clips help keep the beads from bunching and falling off the bracelet. You usually require 2 - 3 clips per bracelet. Finally select your Pandora style beads of choice. These beads all have a large inner hole that simply slide onto the bracelet. 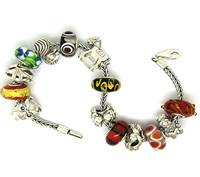 Choose from a combination of glass charm beads, metal charm beads and birthstone charm beads. Pick and slide your beads onto your bracelet in the order desired to achieve the look you want. Then apply your clip beads to separate the sections. If you are not happy with the look, simply unclip and slide off the beads and start again. For a full range of Pandora style beads at International Craft.